"I don&apos;t know, I just feel like-What if he doesn&apos;t actually love me?" You sighed into the phone. You  needed to talk to someone, get some things off your chest so you called the only person you could think of. Your best friend. "Maybe I&apos;m just over thinking or something..I just I love him so much, he could do so much better. Ya know? I can&apos;t help but think I&apos;m just a filler until someone better comes along." "I didn&apos;t know you felt like that." You jumped a little hearing Gerald&apos;s voice fill the room. You turned around to see a you boyfriend with a sad look on his face. "I&apos;ll call you back." You lied, ending the call. "Y/N, Why didn&apos;t you tell me you felt that way?" Gerald asked walking closer to you. "How would I even go about telling you something like that?" "Why do you feel like that?" He questioned, taking your hands in his. "I don&apos;t know, It&apos;s just-I&apos;m just me. 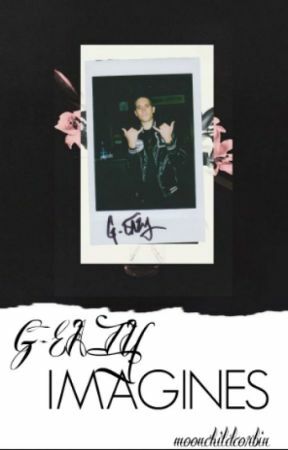 You could do better, you&apos;re G-Eazy, you could have anyone you wanted with the point of a finger." You reached up and wiped away the tear that had fallen down your cheek. "I love you so much, I don&apos;t even deserve you. You are the best thing that has happened to me. You put up with my crazy schedule, the getting up early and being gone all the time. Please don&apos;t ever doubt that I love you, because you are my everything. I&apos;d be lost without your cute face." He smiled, pulling you into a hug. "I love you so much, G." You said holding him tightly. "I love you so much more." He laughed kissing the top of your head.